Well the people who said the first game was boring (not that I agreed with them) aren’t saying that anymore. A few scattered thoughts from this one. There were an inordinate amount of 50/50 calls with both sides copping a few. Queensland seemed to cop most of it, the GI no try call being the most obvious, but the NSW forward pass, the Morris try and every time Aaron Woods carted the ball up and was stripped/dropped it (depending if you see through Maroon or Blue glasses) were some of the others. In the end (disclosure – I see through Maroon glasses), NSW deserved the win and Queensland’s goal line defence just wasn’t good enough to win. They will tell you that themselves I’m sure. GI played himself back into form. He was immense. I’ve watched him a lot lately and I am convinced he has been carrying a lower leg or knee injury for the first half of the season. Just didn’t look like GI until this game. He might be still on the mend as he shelved the goanna celebration. The NSW forward pack were unstoppable throughout. Gallen et al really owned the middle third. 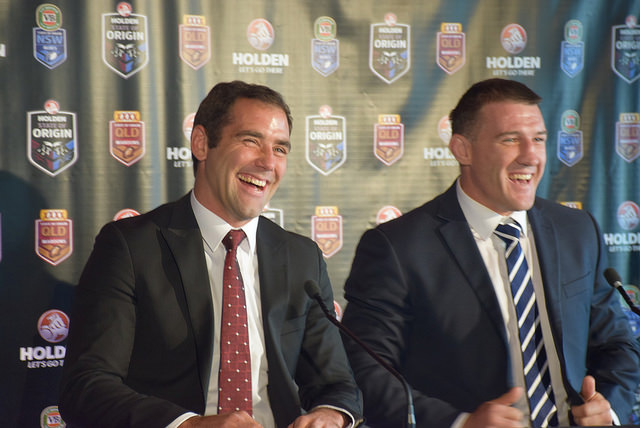 The League of Extraordinary Gentleman is totally unconvinced with DCE. The League hypothesises that DCE’s reputation has been bolstered by the presence of Kieran Foran and I must say the case is building against DCE. He wasn’t totally convincing on Wednesday night and his form has been inconsistent this year. I’m not writing him off yet at this level but the jury is still well and truly out. Loving these Cam Inman pieces (here and here) on State of Origin from an American perspective. Cam Inman is a Bay area journalist who covers the San Fransico 49ers. He has been writing some stuff on Jarryd Hayne as well. It is a symbiotic kind of thing. I always enjoy a bit of cross-pollination. The Dubs. NBA Champions. Nice. The PNG Hunters. I have a massive soft spot for these guys (as regular readers of TGOS will know). Big crowd at the new stadium at Port Moresby (circa 15,000) and winning their way towards the top of the ladder. I am hoping that they can hold it together financially but on the field they are doing everything they can. Martin Taupau – Tries – 2, Run Metres – 126m, Try Assists – 0, Tackle Breaks – 11, Tackles – 22, Offloads – 1, Line Breaks – 2, Line Break Assists – 0, Errors – 0, Penalties Conceded – 1 and Distance Alex Johnston landed after being shunted by Marty ‘Kapow’ Taupau – 100m. James Segeyaro (Panthers) for Nathan Peats (Eels) – To get my playing numbers up closer to 17 after Peats’ injury (plus he is on a bye this week). Plus Segeyaro is averaging more.